Report says he was killed in point blank range. 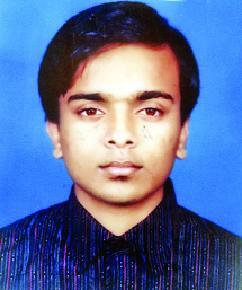 Kazi Imtiaz Hossain Abir was a student of higher secondary level at the Northern College in Dhaka. The family of Abir stated that he was never involved in any crime nor any kind of addiction. 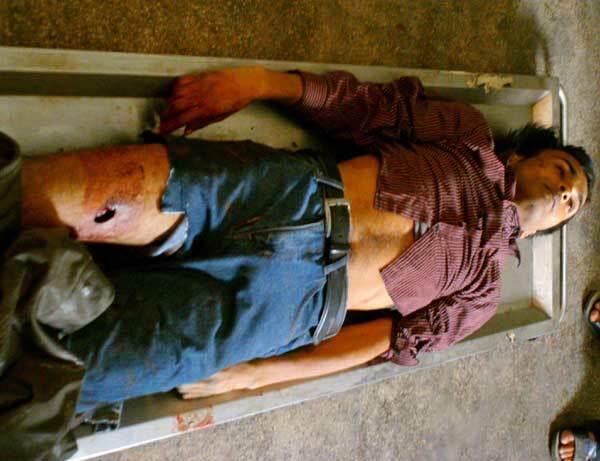 Abir was a drug-addict and he died in crossfire with police. Kazi Mohammad Golam Faruk told Odhikar that he lives in a rented house (House No. 31, Road No. 21, 2nd floor, Rupnagar Residential Area, Pollobi, Dhaka) with his wife Monoara and three children. He is the Deputy General Manager, Finance Department, of Titas Gas. He said that Abir was a first year student of the Department of Business Studies, Northern College at Mohammadpur. At around 7:00 pm, on January 10, 2011, Abir went out to watch a badminton game at the nearest playground, located at Road No. 22. At around 8:30 pm, his wife Monoara phoned Abir to come back home. However, an anonymous person received the phone. His wife wanted to talk with Abir. But the person on the other end of the line did not respond. Moreover, he cross-questioned: "What is the address of Abir's house? Is there any relative of Abir?" Still 9:00 pm, Abir's mother attempted several times to talk with Abir but she failed. Later on, the phone was switched off. As Abir did not come back home that night, he informed their relatives about the incident and told them to search for Abir. Kazi Mohammad Golam Faruk also told Odhikar that at around 7:00am on January 11, 2011, he saw the breaking news on various television channels that: "A youth named Abir was killed in crossfire by police at Pollobi." He then informed his younger brother, Kazi Abu Jafor Siddique, about the incident. Abu Jafor contacted the Pollobi Police Station by mobile phone. He was informed that a boy named Abir had died in crossfire by police and the body was in the morgue of the Dhaka Medical College Hospital. Abu Jafor went to the morgue at 8:00 am and after identifying the body of Abir, he confirmed the news to Kazi Mohammad Golam Faruk. Faruk stated that at around 6:00pm on January 11, 2011, Abu Jafor went to the morgue and picked up the dead body of Abir to take back home. At 7:00 pm, it was buried in Shaheed Buddhijibi graveyard at Mirpur. There was no case or General Diary (GD) against Abir and he was not addicted any drugs or liquid. Nevertheless, he was slain by the police. But Kazi Mohammad Golam Faruk did not file any case against police in any Police Station or Court because of the fear of police harassment. Kazi Abu Jafor Siddique informed Odhikar that at around 7:00 am on January 11, 2011, Mrs. Monoara, Abir's mother, made a phone call to him. She informed about the breaking news on various television channels that a boy named Abir was shot dead by police. He then wanted to inquire about it at the Pollobi Police Station by one of his relatives and it was confirmed to him that a boy named Abir had died in crossfire by police and the body was in the morgue of the Dhaka Medical College Hospital. He went to the morgue at 8:00am and identified the body which was kept in the freezer of the morgue. He noticed the sign of two bullets on the right knee of Abir. At 3:00 pm Shormila Afrin, the Executive Magistrate, came to the morgue and made an inquest report of the dead body. At 4:00 pm Dr. Prodip Biswas completed post-mortem. After the completion of post-mortem, he received the body from the morgue at around 5:00 pm. At around 7:00 pm, on January 11, 2011, Abir was buried at the Shaheed Buddhijibi graveyard at Mirpur. Mohammad Joynal told Odhikar that he lives in the Balurmath slum under the Beribandh of Pollobi. At around 8:30 pm, on January 10, 2011, he, after having a cup of tea from a tea-stall located at Beribandh, attempted to return home. Suddenly, he heard the sound of two bullets from the Balurmath adjacent to his house. He headed towards his house quickly. He noticed 3/4 policemen coming out of intense fog. One of the police told him that a criminal named Abir was shot. He saw a boy lying on the back and moaning. His right knee was bleeding heavily. Joynal noticed a weapon fallen beside his right hand. He recalled that moaning ended and the boy died. Joynal narrated that about 30 minutes later, a number of pickup vans of police and RAB came there. Police took the dead body over to the Beribandh. A policeman named Ismail of Pollobi Police Station, made a seizure list in front of him. He, with his neighbors Aziz and Shahabuddin, signed in the seizure list as witness. Later, he was informed by police that at around 8:00pm, the boy came to purchase Ganja/Marijuana from a drug-dealer Babul. The boy wanted to give Taka 80 for marijuana which originally costs Taka 100 but Babul refused. As a result, the boy took out a pistol from his pocket and threatened to kill Babul. Babul, then, tactically convinced the boy to wait there and informed the Pollobi Police Station. At around 8:30 pm when police surrounded the residence of Babul, the boy headed towards the Balurmath aiming his pistol at police. Then police opened fire and the boy was shot on the spot and died. Abdul Aziz told Odhikar that at around 8:30 pm on January 10, 2011, he was having a cup of tea in the nearest tea-stall, located at the Beribandh. Suddenly, he heard the sound of two bullets from the northern side of his residence. He headed quickly towards the spot. He saw 2/3 policemen there. Police told him that robbers came to the slum. There was a gunfight between police and robbers, one robber was shot down in crossfire between the police and robbers. Police took him to see the man shot. He noticed a young boy lying on the ground after being shot on his right knee. He had never seen that boy in this slum before. Police told him that the robber shot was named Abir. Later on, many slum-dwellers gathered there and one policeman dragged the dead body to the Beribandh. After 10/15 minutes, some pickup vans of police and RAB came over. Police prepared a seizure list and he signed there as a witness. Assistant Sub Inspector (ASI) Mohammad Ismail Hossain told Odhikar that on January 10, 2011, that he with patrol forces was on duty at Beribandh area in Pollobi in accordance with PCC no. 150/11 and GD no. 701. The patrol team led by him also included Constable Mohammad Mujibur Rahman, ID no. 2557 and Constable Mohammad Saidur Rahman, ID no. 19883. At 8.35 pm, Mohammad Iqbal Hossain, Officer-in-Charge, Pollobi Police Station, informed him through mobile phone that 5-6 robbers at Balurmath under Beribandh, Block 12/E, Pollobi, had attempted to rob the slum. After being informed, he reached at the spot at 8:55 pm. After detecting the presence of police forces, the robbers opened fire at police randomly. Police opened counter-fire and the robbers attempted to escape. He, at the time of firing, moved some steps ahead and noticed that a criminal with a revolver in his right hand was lying on the ground with injuries. He caught the criminal. ASI Ismail asked him his name and he responded that he was Abir. Later, he became unconscious. He sent Abir to the National Orthopedic and Rehabilitation Institution (Orthopedic Hospital). At 9:25 pm, he rescued a revolver, two rounds of bullets and two blank cartridges from the spot and made a seizure list. The slum-dwellers Joynal (48), Shahabuddin (45) and Aziz (50) signed the list as witnesses. ASI Ismail also stated that he and Constable Saidur Rahman became injured by this incident and were admitted to the Modern Hospital at Pollobi. He recovered soon but Saidur was referred to Rajarbagh Police Line Hospital. On the basis of the incident ASI Ismail filed three cases against Abir and 4-5 anonymous persons regarding the issue of assembly to rob, carrying illegal arms, opening fire to murder and resisting the officers to perform governmental duty. 1. Case no. 27, Pollobi Police Station; Date- 10/01/2011; Section 19 (ka) of the Arms Act of 1878; SI Mohammad Hekmot Ali was assigned to investigate the case. 2. Case no. 28, Pollobi Police Station; Date- 10/01/2011; Section 353/332/333 of the Penal Code. It was filed to resist the official duty and make the government employee injured. SI Yasin Munsi was assigned to investigate the case. 3. Case no. 29, Pollobi Police Station; Date- 10/01/2011; Section 399/402/302 of the Penal Code; It was filed to assembly for robbery and attempted to murder. SI Ezazul Islam was assigned to investigate the case. Officer-in-Charge (OC) Mohammad Iqbal Hossain told Odhikar that on January 10, 2011 at around 8:00pm, he was informed that 5-6 robbers in the residence of drug-dealer Babul were preparing to rob the slum located at Balurmath under the Beribandh, Block 12/E at Pollobi. He, then, ordered ASI Ismail Hossain who was in patrol team, to seal the drug club and arrest the robbers. ASI Ismail, with other police forces, went to the spot according to the order. There was gunfight between the police and robbers and one robber named Abir was shot down. Abir was taken to the National Orthopedic Hospital and Rehabilitation Institution. The duty doctor Dewan Nurul Islam declared him dead. Later Abir was sent to the Forensic Medicine Department of Dhaka Medical College Hospital (DMCH). The doctor on duty at the DMCH confirmed his death. OC Iqbal Hossain said that after the incident, Imtiaz Ahmed, the Deputy Commissioner of Police (DCP), Mirpur Zone, made an investigation. He suggested to Odhikar contact with DCP Imtiaz Ahmed. DCP Imtiaz Ahmed told Odhikar that at around 10:00 pm on January 10, 2011, an incident of gunfight between the robbers and the police force of Pollobi Police Station took place at Balurmath area in Pollobi where a boy named Abir was shot down and died under treatment in hospital. He made an investigation regarding the incident. He informed Odhikar that he has already submitted the investigation report to the police headquarters. He said that Abir went to the Balurmath slum under Beribandh, block 12/E, Pollobi in order to kill drug-dealer Babul. After being drunk, Abir with 5-6 anonymous persons were preparing to rob the slum. A gun fight took place between the two parties when a patrol police team went to the spot. As a result, Abir was shot in gunfight and died under treatment in hospital. Dr. Nurul Islam told Odhikar that on January 10, 2011 at around 10:00 pm, two policemen of Pollobi Police Station brought the body of Abir to the hospital. It was written on the Police Command Certificate (PCC) of police details of Abir, father unknown, age 24. One police told him that Abir was shot in crossfire by police. Nurul Islam noticed that bullets crossed over his right knee which caused split the main blood vein. Apart from that, there was no sign of torture on the body of Abir. He also confirmed that Abir was not a drug-addict. He prepared the death certificate and police took the body to Dhaka Medical College Hospital for post-mortem. Shormila Afrin told Odhikar that at around 11:00 am on January 11, 2011, she was informed by the order from the Deputy Commissioner that a boy named Abir was killed in crossfire and the body was in the morgue of the Dhaka Medical College Hospital. She reached the morgue with the order of the Deputy Commissioner at 3:00pm and made an inquest report of the dead body. She mentioned that there were signs of two bullets under his right knee. Those two bullets crossed over the knee. Except this, there was no other sign of torture that could cause his death. Dr. Prodip Biswas refused to talk with Odhikar about the post-mortem of Abir. Sekendar told Odhikar that at around 11:00 pm on January 10, 2011, police brought the dead body of Abir to the hospital under Command Certificate on the case no. 29 with Pollobi Police Station dated 10/01/2011. Police stated that Abir died in crossfire by police. Sekendar, at the request of police, kept the body in the freezer of the morgue. At around 3:00 pm on January 11, 2011, Shormila Afrin, Executive Magistrate, made an inquest report of the body. Later on, Dr. Prodip Biswas conducted the post-mortem. The post-mortem was numbered 57, dated 11/01/2011. He said that bullets crossed over the right knee of Abir. There was no other sign of torture and no indication of addiction on the dead body. He wrapped up the body with the burial clothes after washing it in the morgue. At around 5:00 pm, Abir's uncle Kazi Abu Jafor Siddique received the body. During fact-finding mission, Odhikar noticed dissimilarities between the witnesses and doctor of the hospital on their comments. Police opined that a group of robbers were preparing to rob the slum at Balurmath under Beribandh area in section 12, Block E of Pollobi. After being informed, the patrol police team surrounded the area. The alleged criminals started firing at police and the police also opened fire in response. During the gunfight, a boy named Abir was shot down. Afterward, police took wounded and allegedly addicted Abir to the hospital where he died under treatment. Police filed cases against Abir and it was written in the First Information Report (FIR) that Abir was 28. But the Doctor of the hospital told that Abir was taken dead to the hospital and he was not addicted. Abir’s age was 24 written in the death certificate. On the other hand, Abir was 16 according to the Secondary School Certificate. Some witnesses also expressed that Abir did not open fire at police. Babul, the drug-dealer, is missing since the incident. Odhikar urges the government take legal action against those involved in the killing of Abir through an independent judicial investigation. Drug edict that's why Kill. Then First kill the police who sell the drugs, addicted police then kill general people..... This police should be punished otherwise crime doing by police increase.